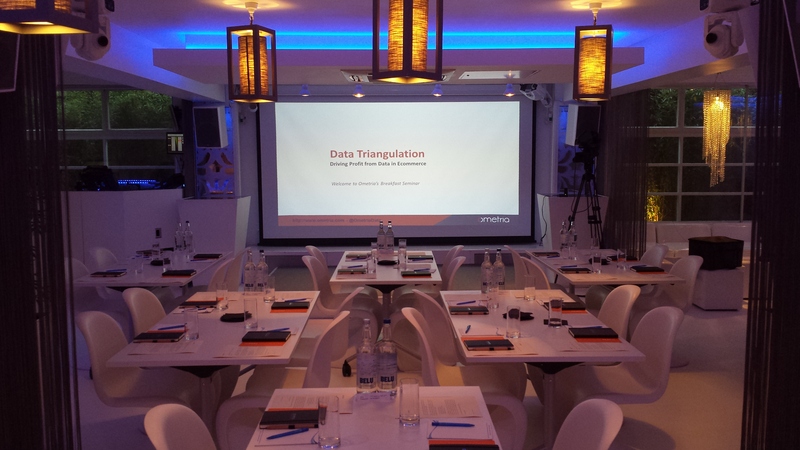 This Wednesday March 5th Ometria held its first exclusive seminar with Dr Mike Baxter on the subject of Data Triangulation. The small but cosy venue at Vanilla in London quickly filled up with a group of special invitees, who were able to mingle and network before Dr Mike Baxter took the floor to begin his seminar. Dr Baxter has been an e-commerce consultant since 2001 and has worked with the giants of the online world (Google, Skype, Argos, Dell) as well as several highly successful SMEs (Crabtree & Evelyn, Cox and Cox, Joy, Flowercard). He is the author of several best-practice white papers, is an industry course leader on the MSc in Digital Marketing and has chaired the 'Customer stream' of the Internet Retailing conference for the past 5 years. Although the full length video will be available soon, I’d like to share with you some of the important points that Dr Baxter brought up during his seminar. How Does Data Triangulation Work? Vilfredo Pareto, an Italian economist, first came up with the law of the vital few, where 80% of the effects are determined by 20% of causes. In agriculture he found that meant that 80% of peas came from 20% of pods, and so on. When applying this principle to ecommerce, the numbers speak for themselves. Most Ecommerce managers are already aware that their highest CLV segment will account for a large percentage of their business. They also know that products that are continuously in demand and have the highest margins are their best sellers. 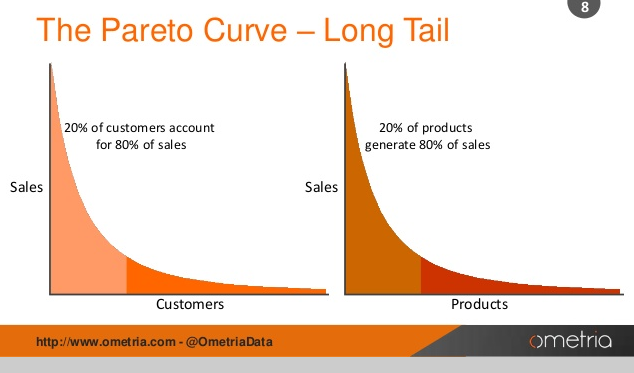 Applying the Pareto principle to discover your best selling products and what we like to call hero customers is one way to simplify and clarify data that your ecommerce organisation already has. Learning how best to leverage your data is key is growing your ecommerce business and becoming a data-driven company. Clicked most often This refers to a product’s Click Propensity, or clicks as a percentage of impressions received online. Products can be identified according to their click propensity and then moved up or down on a product category page, or onto the homepage to attract viewers to browse more. Bought most oftenProducts that have a higher purchase propensity and views than expected should be adjusted to match traffic flow on your website. Highest order valueMerchandising is key to getting the most out of your products, so you should adjust your products according not only to revenue but margins and returns to ensure the highest order value. Encourage most return visitsThese products are usually low margin or discount items that encourage return visits and a higher spend. When you have this data in hand, you can begin to see which products you should focus on, and how to merchandise them online as well. The next step is to find your Best Customers. Recency refers to the freshness of your brand’s relationship with your customers. Recency indicates when customers slip from active to inactive and is a vital measure of business vitality. Frequency is a measure of demand in the number of orders over a period of time. Monetary Value is a measure of customer worth, indicated by AOV, Average Order Value. 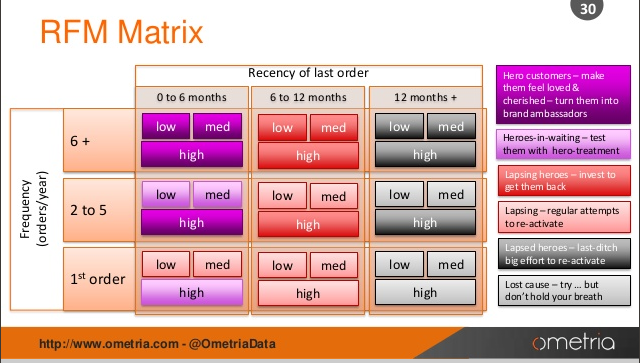 As the chart above demonstrates, the dark purple groups are your hero customers. They purchase from your store with regular frequency and recency, in this example with over 6 orders in a 6 month period. 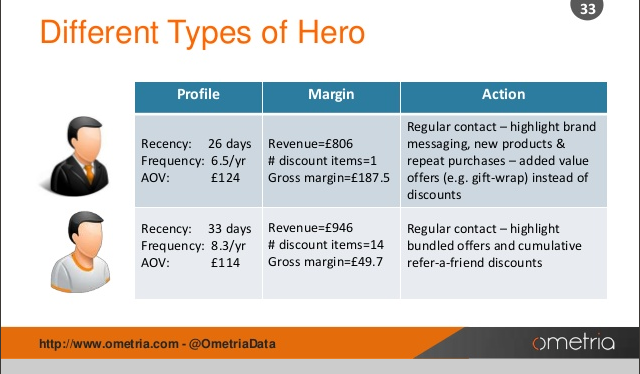 These are your hero customers and they demand more attention, with the highest potential to turn into brand ambassadors for your brand. The dark red groups are lapsing heroes. They have made several purchases in the past but have not purchased lately, in this case over 6 months. These can be indicative of sale savvy shoppers, or holiday gift buyers given the time of year and you can use a number of different tactics to get them back. You should invest in these customers through retargeting as they will be most likely to come back into the fold. The dark black groups are lapsed heroes. These once-upon-a-time heroes have gone away almost completely. They have made many purchases, but a long time ago, which in this case is over a year. You should make a last effort to get these heroes back, keeping in mind the reasons they may have left. Have you made any major changes to your store or merchandise? Was there a particularly good sale event that your store has stopped? Make an effort to retarget these lapsed heroes, but don’t spend next month’s rent on it. Segmenting your customers this way will allow you to see which customers to invest more money and time into, and which are less valuable to your business. As you can see, each type has a distinct profile for their spending habits, monetary value and what kind of selling tactics to use for them. The actions should also include the right products for their type of behaviour. And so you can now see how generating profits is a measure of how well you can utilise your current data to leverage your best products and best customers. Differentiating how much money and time you spend on each type of customer, as well as how you promote your products online will ensure that you get the most of your ecommerce store.